How much time do you spend taking care of yourself? I’m starting to realize self-care really is important. In fact, one might argue it’s vital if you want to keep functioning. Of course you don’t want to develop a self-centered attitude, but meeting your own needs isn’t selfish. In fact, it’s kind of a prerequisite for being unselfish because you can’t be there for other people if you’re worn so thin there’s nothing left to give. 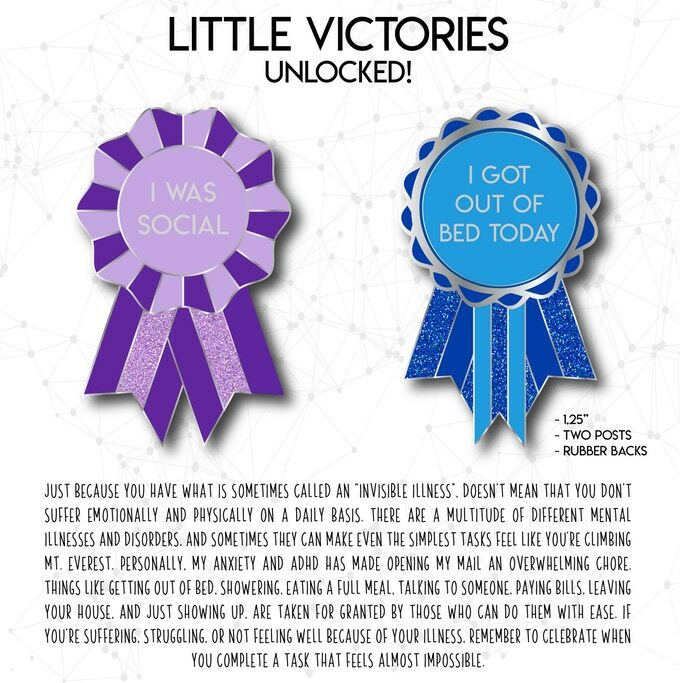 I probably won’t be ordering this particular pin style, but this past week climbing out of bed or talking with people did feel like something I might deserve a ribbon for. It’s amazing how “little things” that seem so easy when you’re not walking around in an apathetic fog or feeling like you could fall asleep any moment suddenly become well-nigh impossible Writing, cooking, eating, driving, interacting with people — they’ve all felt incredibly difficult. But there are some things I’ve just had to keep doing, like meeting certain work deadlines, eating food, and going to church. I know that if I miss those things I’ll feel worse and/or it will have long-term negative effects on things that are important to me when I do care. So I made myself get them done. 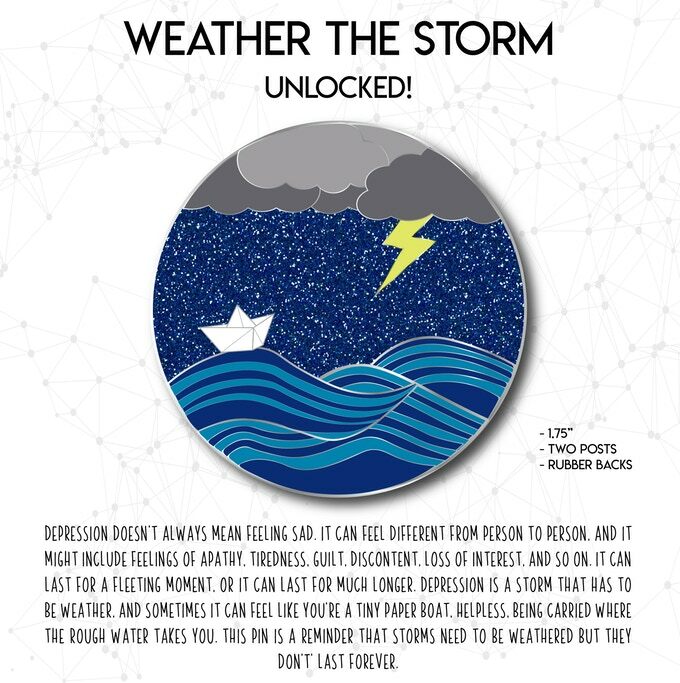 The text on this pin reads “feel everything.” I’m becoming a firm believer in this. I certainly don’t mean you should let your emotions control you or that your feelings are always going to tell you something that’s good for you. But I do think it’s vital that we let ourselves feel what we’re feeling and learn to process those emotions in a healthy way. Bottling things up and refusing to address them doesn’t usually make them go away. It just lets them build up until you’re forced to deal with a whole messy jumble of emotions farther down the road. So let’s all make the time to take care of ourselves and give ourselves permission to feel everything. And maybe we can all learn together how to process the tough things and help each other when we’re struggling. 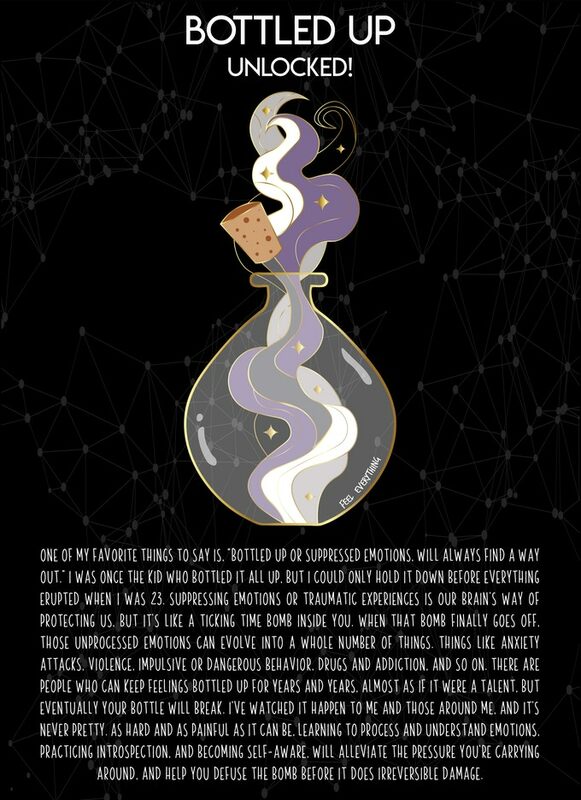 If you like the pins I’ve talked about in this post, then make sure you check out Snarky Co. Here’s a link to their Instagram. Where Do You Find Your Self-Value? Before we can become the best versions of ourselves and have a right view of ourselves, we have to recognize our true value. The world will tell you that your relationship with yourself is the most important relationship you have, and that increasing your self-esteem will correct any problems you have with feeling like you’re not enough in some way. But following that advice isn’t deeply satisfying because I think deep down we all realize that we can’t assign value to ourselves. That begs the question, “Who can assign value to you?” Other people, society, or impersonal metrics aren’t good measures either. The only satisfactory answer is God. Only the Creator can assign value to His creation. He knows what He created you for and who He created you to be, and therefore only He can declare how valuable you truly are. We’ve been talking about Ecclesiastes here on this blog for a couple week now (click here to read “Crash Course in Ecclesiastes” and here for “Letting Death Give Us Perspective On Life“). One of the things that Solomon does in this book is present an in-depth analysis of all the different places that we can look for value. Solomon experiments with finding value in his own wisdom, in pleasure, in wealth, in fine works, in great power, and in the legacy you leave for future generations. But he describes it all as “vanity” (hebel, H1892) — a transitory, unsatisfactory thing. As we modern people read through Ecclesiastes, we often label Solomon as depressed (probably accurate) and having low self-esteem. But Solomon himself doesn’t describe the problem as not esteeming himself enough. He knows the self isn’t a good place to look for value, and he wants something or someone else to give life meaning and tell him his purpose. One of the more helpful (for me, at least) analogies that my counselor has used as we work on my anxiety is that we can think of our minds as a big open field. As we live and grow, our thoughts travel over this field and we start to wear-down paths as we think along the same lines over and over. For example, little Marissa grew up in a safe, cozy home with parents who told her she was loved. So the “I am loved” thought-path got a lot of travel. It became an easy path to go down. But at some point, a conflicting message came in and it shifted the path. No longer “I am loved” without qualifiers, but now “I am loved by my family and God” because those are the ones who haven’t let me down or rejected me. And even though there’s evidence to the contrary coming from many friends, anxiety adds the idea “and no one else” to that thought-path. Your brain can be a dirty, rotten liar (to quote my counselor again). And while anxiety doesn’t look the same for everyone who deals with it, one of the common things it does is push your brain toward overestimating worst-case scenarios. You wear deep paths in your mental field that reinforce all the negative things and push positive ones off somewhere in the tall grass. 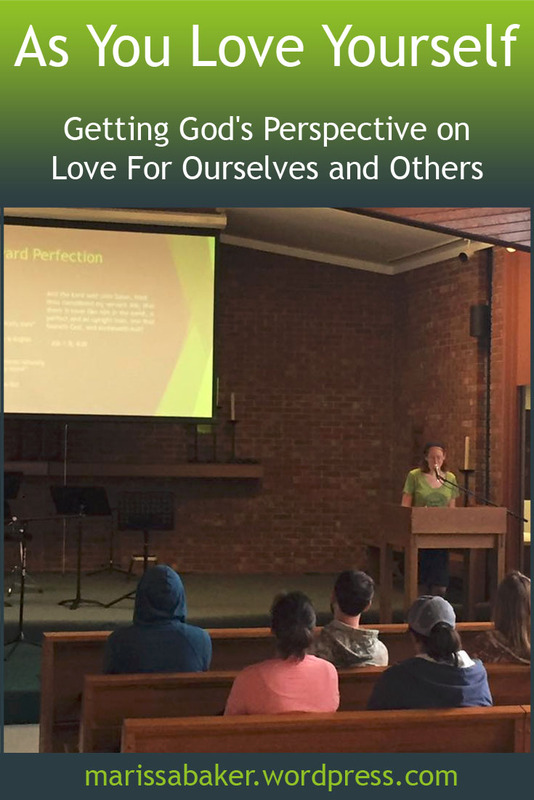 Last weekend at a Young Adult retreat, I gave my first seminar. And it went so well! Praise the Lord — I know anything good I write comes from Him and the fact that I delivered a spoken message in front of people without looking nervous or having a panic attack is a clear “God thing.” Since people liked it in-person, I’ve adapted my notes for a blog post to share with you today. When someone asked Jesus which was the greatest commandment in the law, He gave a two part answer. 1) “You shall love the Lord your God with all your heart, and with all your soul, and with all your mind, and with all your strength.” And 2) “You shall love your neighbor as yourself” (Mark 12:29-31, WEB). The theme for the retreat I spoke at was connecting with God and others, and that’s what these two great commandments are all about. The first tells us how to love God, which is the foundation for building a relationship with Him. And the second tells us how to love our neighbors. Jesus says to love them the same way we love ourselves. 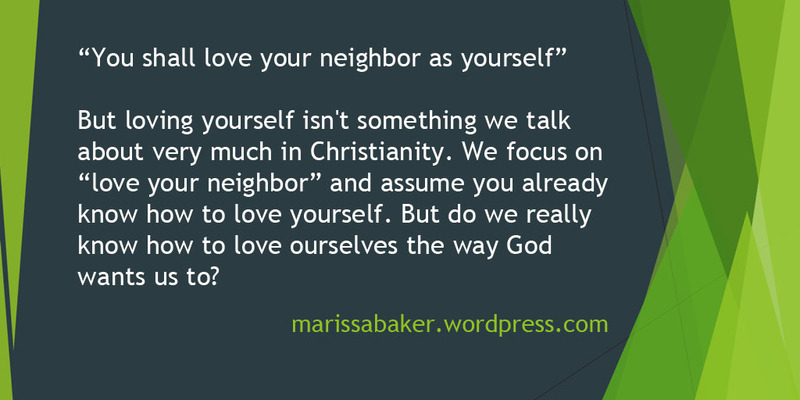 But loving yourself isn’t something we talk about very much in Christianity. We focus on the “love your neighbor” side of this command. 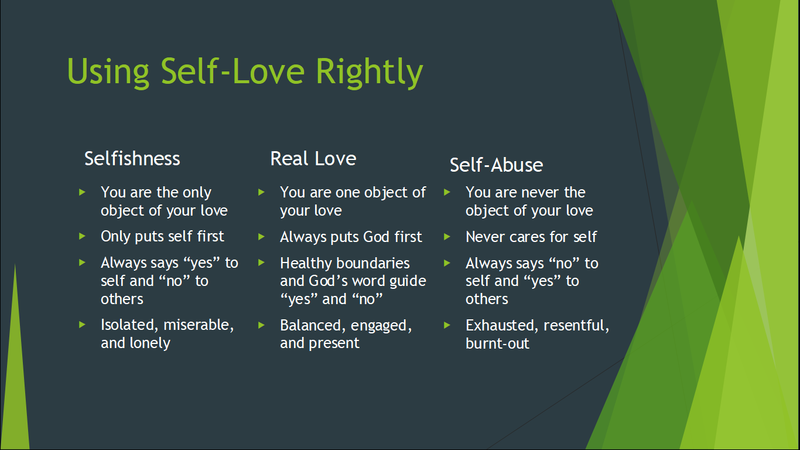 If we talk about the “as yourself” part, it’s often assumed that you already know how to love yourself. That’s part of our culture, right? We have a self-acceptance movement and a focus on looking out for “number one.” If anything, I think most Christians would say we love ourselves too much. 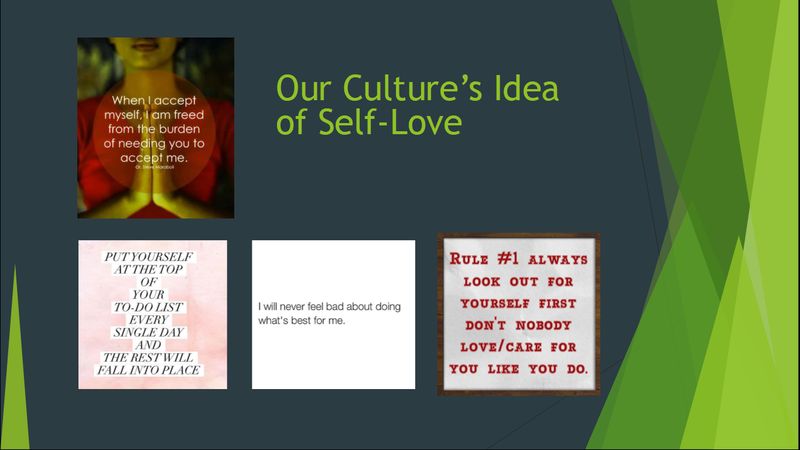 So we don’t talk about it, just assuming we know how to show love towards ourselves and that we can use this as a guide for how to love others. But do we really know how to love ourselves the way God wants us to? The word “love” in the verse we just looked at is translated from a agape. This is a benevolent love that always seeks good things for the person who you’re loving. While it does involve feelings, it’s not what you would call an emotion driven kind of love. For example, if you’re giving a friend advice and one option is going to make them happy and your life easier, but the other option is clearly better for their long-term good, agape is always going to pick the better one even though it’s harder. 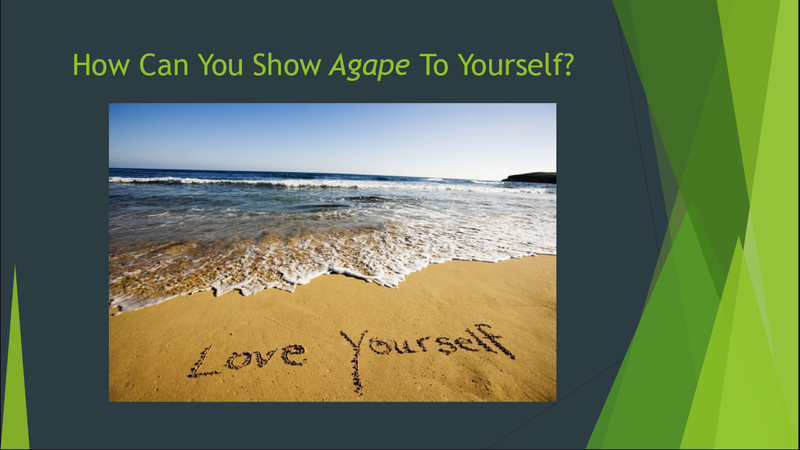 Agape is an incredibly important concept in the Bible. 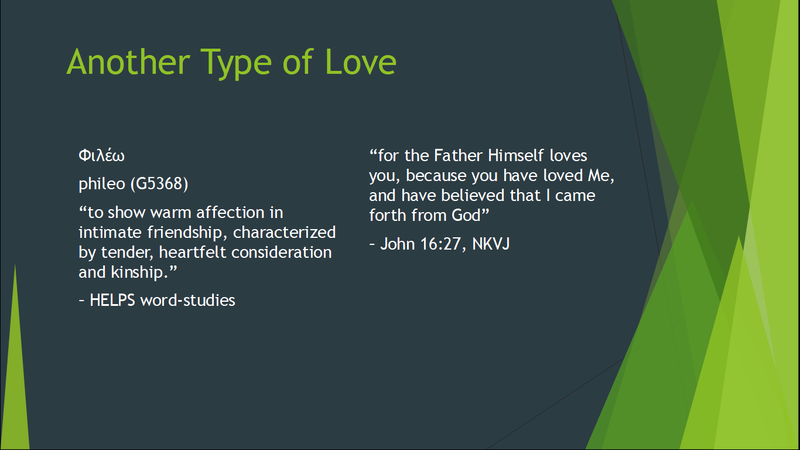 Of the 356 times the words “love” or “charity” appear in the King James Version of the New Testament, 320 are translated from a form of agape (that’s just shy of 90%). It’s so important that the Bible gives us a full definition in 1 Corinthians 13. Are you patient and kind with yourself? Do you let yourself get eaten up with envy, bragging, or pride? Are you treating yourself in a way you’d consider inappropriate if you were doing it to others? Do you get unreasonably angry with yourself? Do you keep an account of the bad things you’ve done so you can use it to beat yourself up? Are you dwelling on the unrighteous things you’ve done or rejoicing in the ways you follow God’s truth? Do you stick by yourself, believe in your ability to do better, and hope good things for your future? When I asked how many people could honestly say they’re loving and kind toward themselves in this way, only one person raised their hand. But when I asked, “How many of you feel guilty about the idea of showing love toward yourself?” about half the group raised their hands. That included me, which is why I actually felt kinda weird talking about the subject of love like this. It sounds a little selfish, doesn’t it? And we know selfishness is bad. So let’s take a moment to clarify a few things. Real love never stops with yourself. If you’re the only object of your love and you always put yourself first, then you have a problem. That’s what it means to be selfish and self-centered. But avoiding selfishness doesn’t mean you refuse to take care of yourself. We’re to offer ourselves to God as a living sacrifice, not abuse ourselves. If you never meet your own needs or do those loving things mentioned in 1 Corinthians 13 for yourself, then you’re going to burn-out. And God loves you way too much to want that. To see ourselves and care for ourselves and others properly, we need to understand how God sees and cares for us. Most of the time when I hear people talk about asking God to let you see yourself the way He sees you, they’re talking about discovering hidden faults. And that is important, because we all know the verses that talk about our inability to know our own hearts. We need God’s perspective to show us where we should change and grow as we keep moving toward perfection. But if we want a more complete picture of how He sees us, then we also need to understand how much He values us. The reason the two most important commands are about loving God and loving others is because God Himself is love. Agape is the key element of His essential character. But sometimes, even if it’s not something we’d say out loud, we think that God loves us more when we’re being good. We treat ourselves as if God’s love is conditional on our having already achieved perfection. But it’s not. Remember Romans 5:8 says, “God demonstrates His own love toward us, in that while we were still sinners, Christ died for us” (LEB). The Father and Jesus Christ thought you were worth the price of Jesus’ life even before you were saved. So don’t you dare say you’re not worth loving now. One of the most interesting studies I’ve ever done was about how God uses the word “perfect” in the Bible. He describes Job as “a perfect and an upright man” twice at the beginning of the story (Job 1:8 and 2:3). We know Job learned and grew as a result of the trials he went through, and yet God could describe him as “perfect” with complete honesty before that growth happened. We tend to think of perfect as the best that you can get, but from this example we see that’s not really how God uses the word. The Hebrew word translated “perfect” is tam (H8535). The word refers to completeness and entirety, but doesn’t necessarily mean finished. Rather, the Theological Wordbook of the Old Testament says the root of tam (H8552; tamam) refers to someone moving “naturally toward that which is ethically sound.” Thus, followers of God can be described as “perfect” while still on the path toward perfection. God will take care of perfecting you – He just needs you to keep moving forward. God loves us even with all our flaws and weaknesses and ways we fall short. He also wants us to grow toward being the best people we can be in Him because that’s what leads to the best outcome we can get – having a relationship with Him that lasts into eternity. Becoming part of God’s family is made possible because He is love. Having God’s agape directed toward you is amazing. The strength of that love has literally shaped the way the entire universe functions. It’s what motivated the Father to send His Son to this earth to live in a human body and become our sympathetic High Priest as well as the sacrifice that makes salvation possible. If that was the only kind of love God had toward us it would be more than enough and more than we ever had a right to hope for. But it’s actually not the only way God the Father and Jesus Christ love us. One of my favorite Bible verses reads, “for the Father himself loves you, because you have loved me, and have believed that I came from God” (John 16:27. WEB). Seems simple enough, but this word is not agape. It’s translated from phileo (G5368). According to Spiros Zodhiates’ Greek dictionary, the word phileo means “to have affection for someone.” HELPs word studies adds that it is “characterized by tender, heartfelt consideration and kinship.” Phileo implies having common interests or friendship with the object of one’s love. This type of love is one we can readily identify with because it’s what we feel for our closest friends. Have you ever thought about God loving you like that? In the context of John 16, Jesus is assuring His disciples that the Father personally listens to our prayers because of His friendly, affectionate love for us and because of our belief on His Son Jesus. If you can honestly say you love Jesus and believe that He’s the son of God, then God Himself wants to be your friend. God is agape and He has that love for every person in the world. God’s phileo, on the other hand, is reserved for those He’s in relationship with – the ones who share His interests, believe in His word, and enter a covenant with Him. The Enemy wants him, in the end, to be so free from any bias in his own favor that he can rejoice in his own talents as frankly and gratefully as in his neighbor’s talents—or in a sunrise, an elephant, or a waterfall. He wants each man, in the long run, to be able to recognize all creatures (even himself) as glorious and excellent things. He wants to kill their animal self-love as soon as possible; but it is His long- term policy, I fear, to restore to them a new kind of self-love—a charity and gratitude for all selves, including their own; when they have really learned to love their neighbors as themselves, they will be allowed to love themselves as their neighbors. For we must never forget what is the most repellent and inexplicable trait in our Enemy; He really loves the hairless bipeds He has created and always gives back to them with His right hand what He has taken away with His left. The thing Screwtape finds disgusting is a facet of Christianity that gives us great cause for rejoicing. God does not want you to hate yourself. He wants you to love Him, and your neighbors, and yourself all in a right and proper way. So, now that we’ve talked about what love is and how God shows love toward us, let’s go back and fill in some answers to our first question. Here’s the list I came up with when prepping for the seminar. Now here’s your homework. Make sure you’re doing these things for the people around you as well as yourself. For example, you could help your roommate with the housework so they aren’t worried about finding time to study and pray. You can be patient with the shortcomings of the people you go to church with and encourage them keep trying. While you’re taking care of yourself as a person who is incredibly valuable to God, remember the people around you hold the same value in his eyes. In closing, I want to quote C.S. Lewis again. This is from an article titled “The Weight of Glory” (click to read the full text). Here, Lewis talks about the potential for each human being to enter the family of God. In 2 Peter 3:9, it says the Lord is “not willing that any should perish but that all should come to repentance” (KJV). God sees the potential of every human being He has created to become something wonderful. And He wants us to see that, too. That’s what Lewis is getting at in these passages. As part of our expression of agape, we need to start seeing our neighbors as candidates for eternal life and valuing their potential as highly as we know God values ours. A couple years ago, I was a funeral and the speaker said the man we were there to remember “lived his life as though it had eternal consequences.” That’s what God intends us to do as well. How we view and treat ourselves and others will have consequences that stretch far beyond this life. We need to keep our eternal potential in mind when we make decisions about how we treat ourselves and by extension how we interact with others. Jesus said, “You shall love your neighbor as yourself.” I hope we now have a better idea of exactly how to do that.